Financial technology has gone global at the moment. Tens of thousands of companies worldwide are developing new technologies, creating solutions based on AI, Blockchain, cybersecurity, mobile banking and much more. The variety of emerging teams and value they add to the community is astonishing. Some startups attract $100+ million in investments from the get-go while others start slow but in the end, solve a huge issue that concerns millions of customers globally and gets snatched by banking giants for legendary money. The point of this research is to uncover the people behind some of the most exciting technologies that most of us regularly use as well as to show how diverse and geographically independent can any startup be. Fintech has always been an idea over origin, occupation or financial status, and this list of the most successful fintech companies is here to prove it. We never wanted to copy just the first 10 of FinTech Forbes or those who are now worth billions. This list includes startups that are poles apart in their view on tackling pressing financial technology issues that come from various continents. To increase the immersion, here’s a chart by Medici Research that shows the dynamic of fintech funding across the globe. The numbers show how important the new ideas and fresh look on the old issues may be. The first part of the list is dedicated to modern giants of fintech. These guys have been on the market for some time and have earned a good reputation as well as landed tons of cash in private investments. Launched in 2011, this startup instantly aimed at a grand scale. Stripe allows building e-commerce platform for any business from scratch. The company has established a partnership with large banks, payment providers and more to limit the efforts needed from the client of the platform. 2016 was the point of massive recognition for the startup, as their valuation reached as much as $9.1 billion. It was ranked #1 fintech startup by Business Insider at that time. Today's state of the company is more promising with more than double of the valuation it had two years ago. Stripe is now worth $20 billion, which is almost level with the likes of SpaceX. The company received funding from a range of companies, including CapitalG, an investment branch of Alphabet - the parent company of Google. A 2006 startup from Georgia, US, is cooperating with more than a dozen partner banks to provide loans for household improvement, healthcare and more. Its main advantage is the custom and pleasant user experience it offers each client. What differentiates GreenSky from other players within the loan market is their heavy use of the mobile application for loans as well as extremely lenient loyalty system. It allows personal interest-free period that in some cases may last up until 60 months. It means that some individuals can repay the loan within five years and don't waste a single coin on interest! By expanding into personal healthcare niche, it has reached its peak valuation of $4.5 billion (Forbes) and started threatening the giants like Wells Fargo. Facebook, Microsoft, and Spotify are also using the services of this Dutch startup. Forrester concluded that as of 2018, the ROI of using Ayden's services was at an astonishing level of 106%. The platform allows building better experience while processing payments globally. The scalable solution allows a simple UI and only a couple of fields to fill to be the only obstacle between the user and the completion of payment. Founded in Amsterdam in 2006, the company proceeded to have the market cap of $20.3 billion as of September of 2018. Their technological developments allowed to sell their clients one solution for all payment methods, thus making them the most optimal option for conducting easy payments regardless of the location or business type. set to evolve and disrupt competition further. The list is more Europe-centered, as hot startups emerge everywhere in the world, including this continent. Here’s how funding trends have been doing shortly after the emergence of the following companies, according to CBInsights. Let’s feed you some more details now. 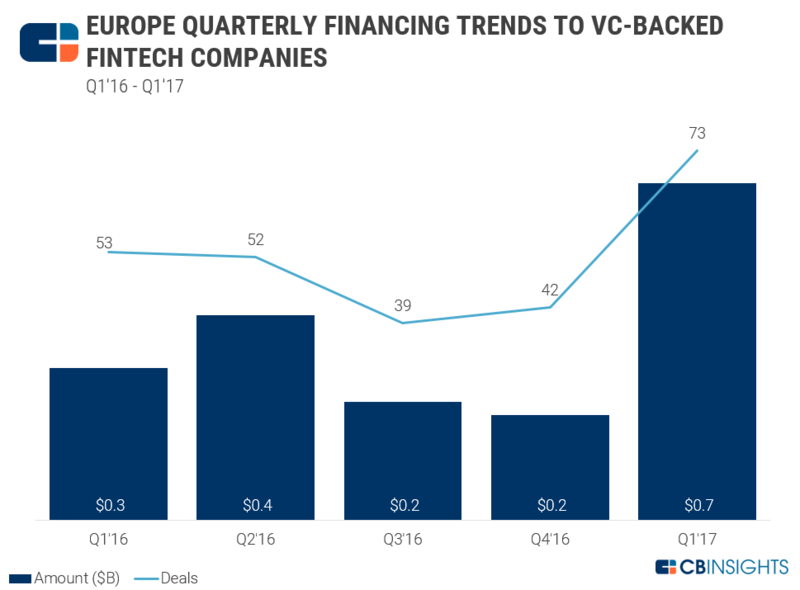 On April 2018, this London-based startup has reached $1.7 billion valuation, becoming the most prominent European fintech startup, surpassing the likes of TransferWise, a long-time leader of the niche. The company offers a simple tool to manage financial assets on a daily basis. It is the simplicity and reliability that attracts clients the most. An account can be created within minutes with tons of goodies to follow. The budget tool allows to control the spendings and manage the amounts of money you want to spend on shopping, for example. Revolut allows to travel anywhere, exchange the money to the local currency and get insurance in one click, while you're at it. Security settings allow customized control over the cards and money transfer capabilities get rid of most of the fees in a few taps. Revolut became an all-in-one tool that is one's financial assistant with versatility previously unseen. Related: Will FinTech Replace Banking as We Know it Today? Circle is pushing towards universal, free and secure money transfers, just as it is with sending a message to the Facebook friends. After its inception in 2013, Circle has branched into multiple divisions, each offering unique products. Circle Pay is the transfer system that simplifies the money sending process significantly. The guys have recently launched an iMessage support - with it the users can transfer funds using just a text message. As of May 2018, after raising an additional $110 million, the company's valuation has reached $3 billion, and the figures are expected to grow further in the future. Insurance probably has the most significant number of unanswered questions that trouble citizens across the world. Clark, an advisor of robotic origin, is ready to provide instant assistance on the matters of insurance. Clark is proficient on uncovering every detail of various types of insurance as well as providing in-depth information on tariffs. The company has recently launched pension support, that allows quick calculation of the pension that takes into account all tariffs, percentages, and sums. Clark was founded in 2015 and since then has acquired $48.5 million in private funding. With this addition that came on April 2018, the company is now valued at $800 million, which takes it high up the list of the most prominent robotic representatives of global fintech. Related: What Are the Top FinTech Trends for 2019?